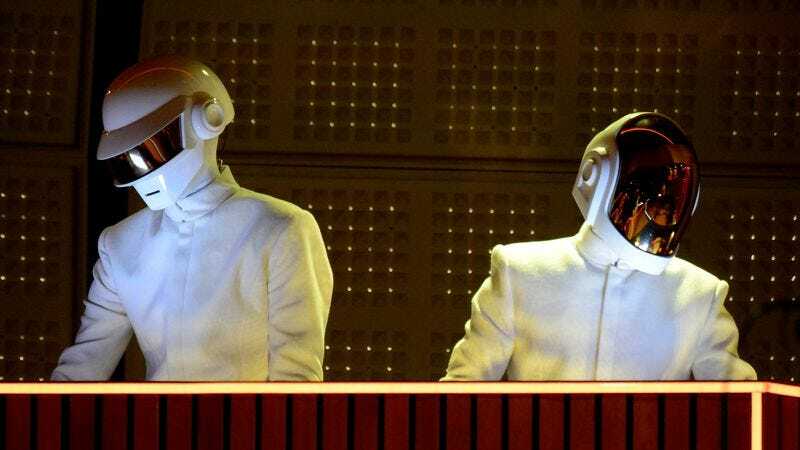 Outside the occasional The Weeknd song or Kanye West collaboration, the members of robo-helmed electronic duo Daft Punk have stayed fairly quiet since the release of their multiple Grammy-winning album Random Access Memories in 2013. Now, though, there are possible hints cropping up online that the band might be gearing up for some kind of album release or international tour. As reported by MTV, the rumors center on a mysterious web site that was sent as a link to the main Daft Punk group on Reddit. Titled Alive 2017—a reference to the band’s Alive 1997 and Alive 2007 live albums—it features the word “Alive” and a hidden countdown clock. Digging into the page source, meanwhile, reveals a message with some coordinates, which line up with eight world cities, including Paris, New York, and Indio, CA, home of Coachella. Taken as a whole, they certainly convey an impression that someone would like people to think that a Daft Punk-related event is being planned for Oct 27. That being said, several Reddit users have pointed out things that look fishy about the “Alive” site’s authenticity. Most damningly, it appears to live on a discount hosting service, a far cry from the more robust servers that house the actual Daft Punk web site. That’s already led a number of people to decide that the site is just an elaborate hoax playing off of fan’s hopes, although we probably won’t know for certain until late October rolls around.